River banks, moist, grassy openings in jack pine stands. A very local species with narrowly ovate-triangular leaves; usually relatively easily distinguished from Viola affinis, which may have similar triangular leaves, by the more pubescent foliage. Two entities occur in Michigan (Gil-ad, 1997); subsp. 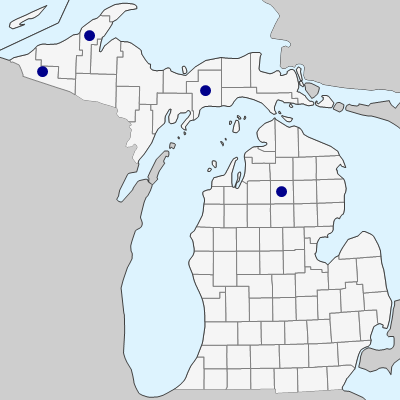 grisea (Fernald) Gil-ad, a Great Lakes region endemic distinguished by greater pubescence overall, densely ciliate auricles and larger seeds, occurring primarily in moist sandy openings in jack pine stands in the Upper Peninsula and northern Lower Peninsula and subsp. novae-angliae, with sparse pubescence, auricles lacking cilia, and smaller seeds, occurring in the Upper Peninsula, primarily on rocky river banks. MICHIGAN FLORA ONLINE. A. A. Reznicek, E. G. Voss, & B. S. Walters. February 2011. University of Michigan. Web. April 21, 2019. https://michiganflora.net/species.aspx?id=2787.